Job fairs are the perfect place for young professionals looking to step into their career. You’ll have access to countless employers who are looking to hire new employees, which could be you. However, there will be a ton of other professionals looking to find a job as well, which is why it’s important to stand out above the rest. First impressions are everything when looking for a new job, so you need to be ready to impress. 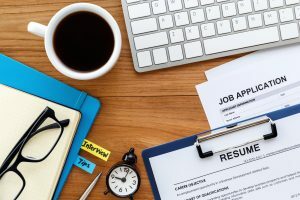 In this blog, we’ll discuss how to prepare for a job fair so you can beat out the competition and get all the job offers you could have hoped for. Hunting for a job is stressful and can even be discouraging, which is why it’s so important to always put your best foot forward when meeting with potential employers. Here are some great tips you should utilize when attending a job fair. Every employer you approach will want to see your resume. Make sure you have plenty of updated resumes to hand out to each employer. Before you go to the job fair, do some research to find which businesses will be there. Think of specific questions to ask each business you’re interested in. This will show them you are serious about the job and have done your due diligence. Make sure you attend a job for in business casual attire instead of your everyday clothing. This will show companies that you are professional and ready to take on a full-time job. If you only have a set amount of time at the job fair, make sure you prioritize the employers that you’re most interested in. This will ensure that you are able to speak with all of the most important companies, and will allow you to visit other businesses if you have time at the end. Job fairs are about selling yourself to new employers, so you need to have a great sales pitch for each company you speak to. Prepare and practice what you’re going to say beforehand so you feel confident when speaking to them at the job fair. Make sure you bring a notepad so you can write down all of the important information you learn at the job fair. Write down the answers to the questions you ask each employer. Most importantly, take down their contact information so you can follow-up the job fair with a thank you note. Using appropriate professional manners can go along way. Speak to the employers with respect. Listen intently when they are speaking, and be sure to thank them for their time before walking away. There may be some employers there who you didn’t prepare to speak with but look interesting to you. Don’t be afraid to approach them even though you weren’t originally planning to. You may find the best jobs by being flexible. If you properly prepare yourself for a job fair, you’ll have the best opportunity to beat out other candidates and land a job. If you have any questions about how to prepare for a job fair, contact us today for more information.